Right The Acres Group has a fleet of 300 trucks, which are serviced in-house by a staff of 15 mechanics. The mechan- ics also service most other equipment including snow movers, snow blowers, mowers, and tree care tools such as chain saws and stump grinders. June 2018 25 Business Culture The attitude of respect and trust per- meates the business. Not just customers but also the employees - from newest hire to the ones that have been there for years – all are treated with respect and trust. Acres Group has notably low em - ployee turnover, around five percent per year. When they determine an employee is not performing up to par, the business has a number of steps to help the employ - ee change behavior. Schwantz says, "We work to fix not fire where possible." A corporate culture of trust and re - spect is not universal in business today Schwantz mentions with some dismay in his voice. Private equity dollars currently own many companies, and they are gen - erally in business to make money, not to serve the customers with a positively mo - tivated work force. Schwantz reports that, like companies, markets can differ. "Every market has a different feel and different expectations." 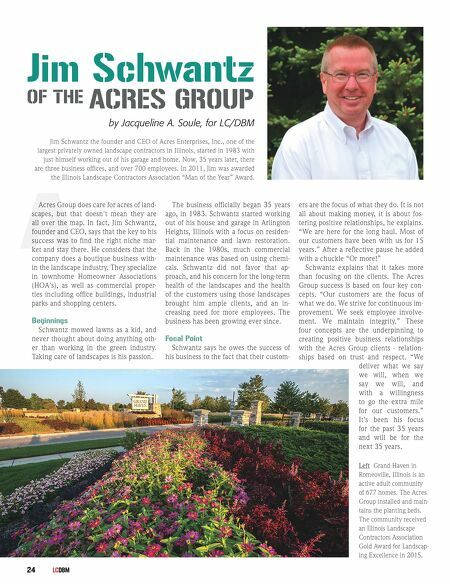 He mentioned that the Acres Group worked in the Michigan market for five years and discovered that it simply wasn't the right niche for them. Now they stay regional in northern Illinois, southern Wisconsin, and northern Indiana. In In - diana they specialize in cemetery parks where they are able to store equipment on site, saving transportation costs. Schwantz comments that, once again, it comes back to focus. He advises, "Rath - er than trying to do 80 different things, find the three or four you do well and fo - cus on doing them extremely well." 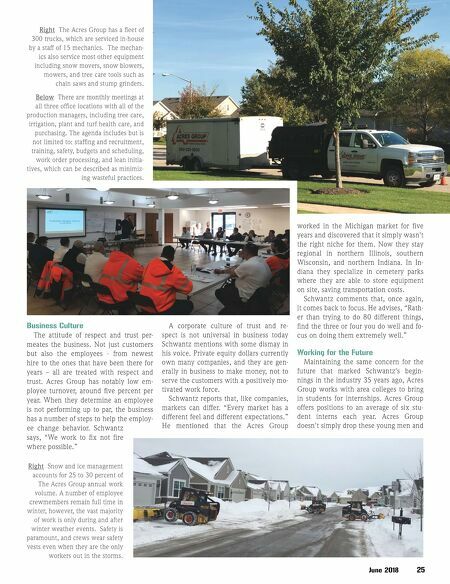 Working for the Future Maintaining the same concern for the future that marked Schwantz's begin - nings in the industry 35 years ago, Acres Group works with area colleges to bring in students for internships. Acres Group offers positions to an average of six stu - dent interns each year. Acres Group doesn't simply drop these young men and Right Snow and ice management accounts for 25 to 30 percent of The Acres Group annual work volume. A number of employee crewmembers remain full time in winter, however, the vast majority of work is only during and after winter weather events. Safety is paramount, and crews wear safety vests even when they are the only workers out in the storms. Below There are monthly meetings at all three office locations with all of the production managers, including tree care, irrigation, plant and turf health care, and purchasing. The agenda includes but is not limited to: staffing and recruitment, training, safety, budgets and scheduling, work order processing, and lean initia- tives, which can be described as minimiz- ing wasteful practices.